Back Row, L-R: Emily Kzany, Teenage Goth Poet; Zanni Kzany, Hostess and Emcee for Cafe Kzany (and Godmother of Snooki); The Reverend Cookie Bon Bon from Le Confession Zen. 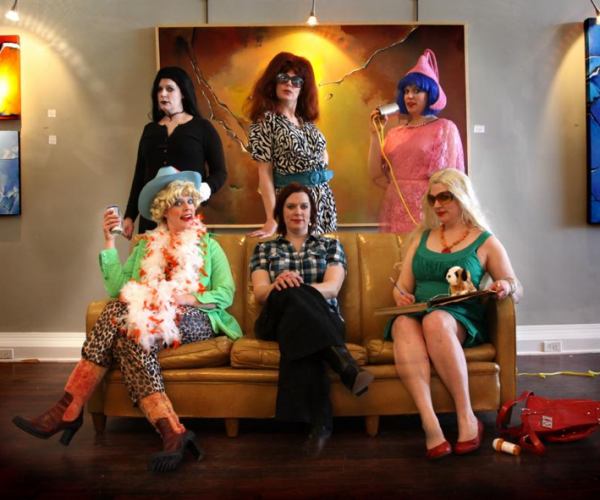 Front Row, L-R: Bobbie Lou Bootstrapper, Director of Creative Regional Arts Projects (C.R.A.P.) for Texas Arts Association; Molliver; Annie Onomus, Celebrity and Author. Photo by Sara and Shane Scribner. Molly O’ Connor is the Oklahoma art world’s best friend, working directly as an advocate for arts as they impact our state, and actively as a performance artist who creates shows that often allude to deeper issues that resonate with Oklahomans. I first met her by reputation only, while working as an intern for an art niche publication I was cryptically told to learn about a mysterious acronym called ONEAL and to seek out Molly O’Connor, the Jedi master at the front of this organization which aims to teach us all about arts leadership. Molly is currently the Director of Cultural Development for the Oklahoma Arts Council. At the Arts Council, her current focus is the Oklahoma Arts Conference, which brings together artists and arts administrators from around the state for a series of in-depth sessions that examine issues in the arts such as funding, districts and communities, and education. She coordinates the council’s annual Leadership Arts Class too. The class is comprised of applicants (including administrators, city planners, volunteers, and artists) who have been brought together to network and learn about programming and positive development for their respective communities. ONEAL (Oklahoma New and Emerging Arts Leaders) was founded in 2008 with help from Americans from the Arts and through collaboration with the Oklahoma Visual Arts Coalition with the purpose of reaching younger potential arts leaders. Through monthly meetings and satellite groups the network has grown and is now statewide, with monthly coffee talks and meetups at the annual Arts Conference and “ONEAL Deals” hosted in cities where a need is found. But Molly is more than a molder of young minds – she is an artist in her own right. Educated domestically and abroad in visual art and design, she has developed a unique style of performance art utilizing a cadre of colorful characters representative of hyperbolic symptoms of society, some related to how arts and arts administration are viewed, such as Bobbi Lou Bootstrapper Director of Creative Regional Arts Projects (C.R.A.P.) for Texas Arts Association and some from personal experience, such as Emily Kzany, Teenage Goth Poet. Some of Molly’s notable performance art pieces include “The Reincarnation of Rosasharn’s Daughter,” a solo performance piece performed at Living Arts Tulsa in April 2011. She portrayed fictional character Rosasharn’s Daughter, driving a car caked in red dirt, where she emerges, as a beauty queen to wash the car and inevitable become wet and covered in red mud herself. The concept comes from the issues faced by the modern Oklahoman eighty years forward from Steinbeck’s Grapes of Wrath. “The concept for this performance piece stems from the conflicts that exist within the cultural identity of the modern Okie. While our state progresses and thrives economically, we continue to be plagued by high poverty, poor health and lack of education. We are, in essence, still haunted by the Dust Bowl.” – Molly O’Connor. You can also find inspiring marathon runners near her home in life-sized Pac-Man costumes, and she does happen to be married to her lawnmower. During the state’s land-run anniversary, she turned her front lawn into tiny plots with little white flags that could be “claimed”, and is slowly campaigning, through photography, for a new era of Miss Oklahoma. How did Molly develop this unusual talent for entertaining? Her characters have really taken on lives of their own. Emily Kzany has frequented local comedy clubs, and has performed poetry, with rumors of a book coming out if she can behave. Bobbi Lou Bootstrapper has been spreading her arts administration wisdom at Leadership Arts gatherings, and I have caught glances at Annie Onomus from behind her burly bodyguards at a few posh art events around town. As Molliver, her role at the Arts Council is growing and evolving, and ONEAL is a part of her that will be left to arts leaders and council members who are coming into the Oklahoma art community. The goal is to continue the conversation about art on both a state and national level. There will be more to report on ONEAL as information becomes available. Curious about that lawnmower thing? We’ve found a clip of it! Tagged Annie Onomus, Arts Council, cs, Dust Bowl, Emily Kzany, Leadership Arts, ONEAL, Pac Man, Rosasharn Daughter, Teenage Goth Poet, Texas Arts Association. Bookmark the permalink.